Constant temperature insulated circular knife heaters applicable whenever a warm or hot knife is required for cutting or trimming, as in the tire and rubber-working industries. Main Heating Cavity — Heater contains a circular heating cavity with a chamfered mouth, which holds the tool being heated. Insulating Blanket — High-efficiency, ceramic fiber, insulating blanket covers the entire outer surface of the heater, allowing higher heater temperature and protection from burns. Easy Electrical Connection — Lead wires extend from the end of attaching pipe to facilitate the electrical connection to a junction box or mounting arrangement. Second Heating Cavity — U-shaped channel can be attached to the full length of the heater’s outer diameter providing a second heating cavity. Heater Guard — Perforated steel heater guard is a safety feature that prevents accidental burns during operation. 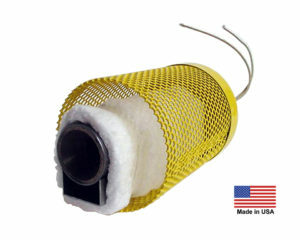 Heater guards are optional on all GY heaters, and sold separately. NOTE: The maximum temperature indicated for all heater models is a guideline only. Actual temperature achieved for each model is determined by application, operating conditions, and size, shape, and condition of the knife or tool being heated.